You’ve probably had these phrases said to you at one point in your life. They all seem fairly harmless and if anything, very well-meaning. But what if these thoughts trickle into your subconscious and impact your view on the world. And since our views influence our reality — WHAT IF — this is also impacting our reality and this making abundance harder to come by. According to author Christie Marie Sheldon — this is EXACTLY what happens to us all. So if you’re facing less abundance and wealth than you’d like — it might be due to you subconsciously taking on these mental barriers. 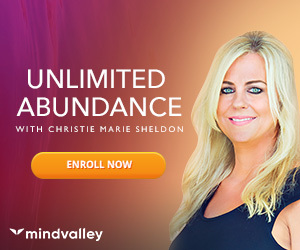 And according to Christie, there are 24 distinct blocks she refers to as Abundance Blocks. Any one of these blocks get really trap your financial goals into a wild tailspin. Which is why Christie is hosting her annual Energy Clearing session with Mindvalley Academy to help you get rid of these blocks as we roll into 2018. If you have the time and energy to invest in this special event, it will be worth every second of it. Even experienced energy healers find it shocking when they see how much their abundance blocks were costing them over the years. You see, financial strategies and taking massive action are all important. But without having your vibration aligned to your financial goals, you’ll face hurdle after hurdle for every step you take. These hurdles are not only stressful, but it’s completely unnecessary. And suddenly, you’ll find yourself making rapid progress. Having conducted these sessions every year since 2012 — Which has seen up to 85,000 people show up for a single session — certainly proves this point. I’m talking about surprise checks in the mail. And other unexpected abundance synchronicities. Imagine what your life would look like if any one of these events happened to you consistently? What Are The 24 Abundance Blocks? Are you winning the game of money?